Published in August, 2010 issue of News from Hope College by Greg Chandler. From the time they were young, Matt Neil ’82 and Mary Vande Hoef sensed a call to become coaches. Growing up in the small town of Hastings, Mich., Neil organized practices and drew up the plays for his sixth-grade YMCA basketball team, which he nicknamed “Matt Neil’s Bruins,” a nod to the great UCLA basketball teams of the 1970s. Meanwhile, in Orange City, Iowa, Vande Hoef dreamed since the third grade of becoming the first female head coach in the National Football League. While still in high school, she was already coaching a softball team at the local junior high school. 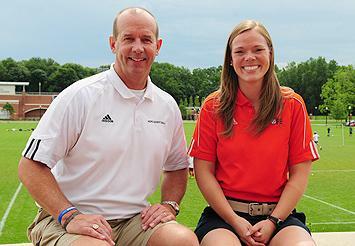 Their separate journeys brought them to Hope, where they are now the newest head coaches in the college’s athletic department. Neil is now the head coach of the men’s basketball program, after having been an assistant coach for 26 years to his mentor, Dr. Glenn Van Wieren ’64, who announced his retirement in April. Vande Hoef takes over as head coach for the Flying Dutch softball team, replacing Karla Hoesch ’73 Wolters, who also retired. “I believe in this place. I believe in the mission. I believe that everybody that enters this institution will have a chance to grow in ways they haven’t even conceived,” said Neil, who enrolled at Hope in 1978, earning his bachelor’s degree in mathematics. Vande Hoef comes to Hope after spending five years as an assistant coach – first at Ithaca (N.Y.) College, where she earned her master’s degree in sport psychology, and more recently at her alma mater, Central College in Pella, Iowa, like Hope an institution affiliated with the Reformed Church in America. Both new coaches say they owe a great deal of gratitude for their opportunities to their mentors – for Neil, it was Dr. Van Wieren. For Vande Hoef, it was her coach at Central, George Wares. Neil said Dr. Van Wieren was a model for him, not only in terms of being a coach, but also in modeling how to be a man of faith. He also said Dr. Van Wieren was open about accepting feedback from his players. “His influence is one that is valuable for any coach – to sit with players, and ask, ‘how do you feel about things,’” said Neil, who began his coaching experience with the Holland (Mich.) Public Schools and also coached Hope’s junior varsity team. Vande Hoef not only played for four years under Wares at Central, but worked with him as an assistant coach. “He challenged me with questions that I didn’t know the answers to, and helped me work through things that didn’t have anything to do with softball,” Vande Hoef said. Vande Hoef, who earned her bachelor’s degree in economics at Central, was a department manager at Pella Windows for five months after graduation and a personal trainer for two years before deciding she wanted to coach softball at the collegiate level. She came to that realization while working a summer camp at Central. “When I worked this camp, I thought to myself, ‘This is where I feel I’m at my best,’” Vande Hoef said. In addition to his coaching responsibilities, Neil will teach in the department of kinesiology, where he’ll hold the rank of assistant professor. Vande Hoef will serve as director of Hope’s intramural program and assistant director of the Dow Center. “My hope and prayer is that I’m able to build trust, complete trust with the people in our program, that they feel incredibly comfortable talking with me about a situation they might bring up,” Neil said.